The lettering on the century-old barn, “Olson Stock Farm, Est. 1919”, represents the family farm that was established almost 100 years ago by Rodger Olson’s grandfather and uncle. But one would be hard pressed to find any livestock on the farm today. Instead, Olson Farms, located near Leonard, North Dakota, is devoted entirely to corn, soybeans and sunflowers. 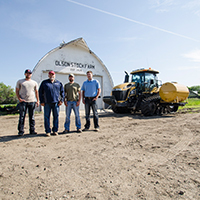 As a Butler sales representative, Nate Gion has to be pleased that his persistence in pursuing equipment sales with Strand Farms near Portland, North Dakota, finally paid off. However, it seems Merle Strand and his son, Jason, are equally delighted. 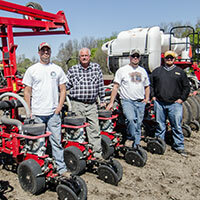 If it hadn’t been for Gion’s efforts to sway their opinions, they might still be using equipment that now seems inferior in comparison, and, worse yet, working with a dealership that doesn’t hold a candle to Butler Machinery when it comes to service. 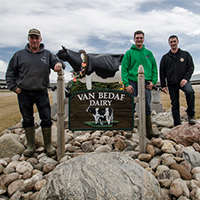 When Corné Van Bedaf and his wife, Conny, moved from the Netherlands to Carrington, North Dakota, in 2008, following a seven–year stop in Alberta, Canada, they brought more than their hopes and dreams. They also brought their passion for Fendt tractors, which are especially popular in Europe.